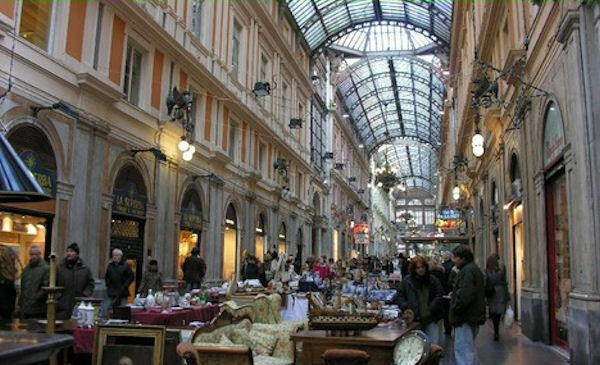 The tour starts on Via Tole, one of Naples’s longest shopping streets, where you will explore numerous boutiques and department stores. Located within this street, which is for the most part a pedestrian area, you will also have the advantage of strolling through the Galleria Umberto I, where you can view all of the impressive neoclassical architecture. At the Piazza Trieste e Trento, you will see the elegant Cafè Gambrinus in the Belle Époque style. It represents a part of Naples’s history, and when you look at the long counter with dolci (cake and pastries), it will be hard to choose! Diagonally opposite the café extends the big Piazza Plebiscito with the Palazzo Reale. After the Piazza’s and Palazzo, you will step onto the most exclusive street in Naples, Via Chiaia. Here, you find mostly brand boutiques, but also antiques and art dealers. The last stop on the tour will be on Via San Gregorio Armeno to see the beautifully hand crafted Neapolitan Nativity Figurines. Remember to bring your camera. Please note – this is a walking tour.